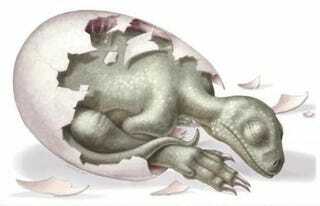 Dinosaur eggs dating back to the early Jurassic are revealing amazing secrets about dinosaurs. These particular dinosaurs were born quadrupedal, then learned how to walk upright, revealing drastic physical changes and a very human-like reliance on their parents during infancy. These eggs are the oldest embryos ever found for a land-based vertebrate. Despite their unimaginable age, they are remarkably well-preserved, allowing scientists to completely reconstruct the original skeleton and interpret the anatomy of the dinosaurs in detail. These particular dinosaurs were Massospondylus, a part of the dinosaur group known as prosauropods and an ancestor of later sauropods like the brachiosaurus or diplodocus. These later species were large, four-legged dinosaurs with long necks. The embryos were fully developed and very close to hatching. The differences between the almost-newborn Massospondylus and its adult counterparts were enormous. They were only eight inches long at birth, whereas the adults grew to be about 16.5 feet long. More amazingly, the creatures were born fully quadrupedal, with relatively long forelimbs and disproportionately large heads. Over time, both of these shrank relative to the rest of the body, as the adult had very short front arms, a tiny head, and a short neck. The adult's arms were so short, in fact, that it was almost certainly bipedal. That means it shifted from quadrupedal to bipedal over the course of its childhood. That's surprisingly similar to the development of human infants, who crawl on all fours before they can walk. Both human and Massospondylus are weirdly proportioned compared to their adult bodies, and that's not the only similarity. The embryos don't have teeth, which when combined with their clumsy bodies would make it difficult for them to care for themselves. That indicates the hatchlings required their parents to actively take care of them, which if true makes this the oldest recorded example of parental care. That's a pretty impressive set of inferences for a bunch of 190 million year old eggs, no matter how well preserved.